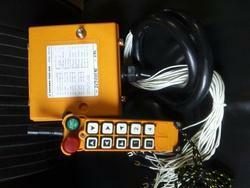 Crane control and radio remote with variety of function and control system available as per your need. We are the manufatuerer and supplier of Radio Remote Control Pendent Station. 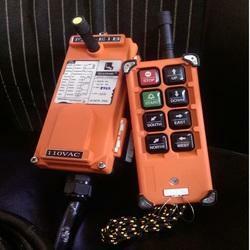 Our provided remote control is vastly admired in different industry for providing safe and secure communication. Offered remote control is manufactured using optimum grade raw material and latest technology under the supervision of our adroit professionals. 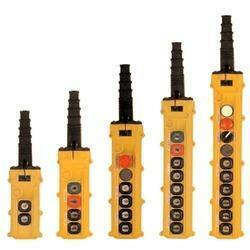 Moreover, this remote control is quality approved in respect with set quality standards. Advance program design, Quick & good performance on movements.PA transmitter housing, water/shock/dust proof Single-raw button transmitter, compact and lighter design, ensure safe & convenient operation.Random security code up to 4.2 billions sets. Each transmitter has own unique ID code.Receiver with 4-LED, quick, simple Judgement for operation status & after service. 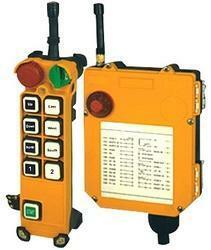 We are involved in offering Crane Remote Control that is wireless thus can be moved from one place to another easily. Our offered remote is designed at vendors' end using quality assured components and the latest technology in adherence to international standards. To maintain its flawlessness, quality controllers test this remote against various quality parameters. 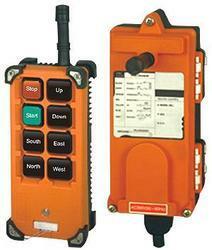 We are one of the leading manufacturer and supplier of wireless Radio remote control system. We are aslo supplier of telecrane radio remote control. 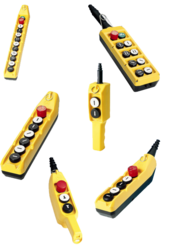 Radio Remote control are widely applied for Overhead crane,lifting equipment. Single hook electric cable hoist ,monorails,single speed electric hoist or electric single speed hoist crane,and used for the industrial remote control. 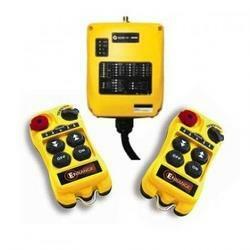 Embicon is Manufacturer for Tele crane Remote in India. we provide all industrial remote control that will suit your needs. Reliable, Quality, Safe, Performance makes our product best. Radio remote control is easy to install and easy to use. 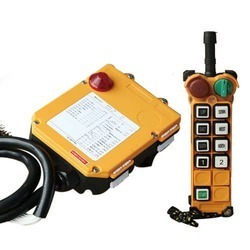 We are leading manufacturer & supplier of Industrial Overhead Crane Radio Remote Control. 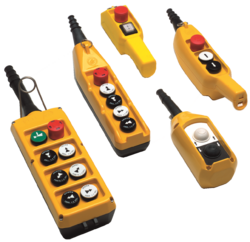 Radio Remote control are widely applied for Overhead crane,lifting equipments. We are involved in rendering a wide gamut of Push Button Pendant Station Pendant Station that is designed & developed using high grade raw material and latest technology with the set universal standards. These pendant stations are examined against various parameters under the supervision of our quality controllers to ensure flawless deliveries. In addition to this, these pendant stations are available in various sizes & dimensions and other specifications as per variegated demands of our prestigious clients. F21-4S-For single-speed single-hook / hoist between the two directions And 7 contact the following remote control of industrial use. With 6 action buttons, including five single-speed buttons, a total stop, Control up to 7 points, Warning devices with battery voltage, the voltage is less than its own circuit, Security key switch to prevent unauthorized use. Set by the computer interface to the internal functions, Up / down, east / west, can be set as to whether mutual inhibition. 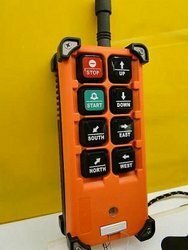 21-E1B radio remote control is mainly used for Hoist, Crane, monorails and tow truck, easy to operate to keep workers safe. One 1m cable connect with the receiver. With the battery voltage alarm device to cut off the circuit when a voltage is insufficient. with the Rotate key switch to guarantee the safety. Up/ down, east/ west, south/ north push button can be set mutual inhibition or not. Spare 1 key can be set start, speed up, jump strokes, ordinary etc. We are one of the leading manufacturer and supplier of wireless Radio remote control system. Embicon is Manufacturer for Tele crane Remote in India. we provide all industrial remote control that will suit your needs. Reliable, Quality, Safe, Performance makes our product best. Radio remote control easy to install and easy to use. Ambition is Manufacturer for Tele crane Remote in India. we provide all industrial remote control that will suit your needs. Reliable, Quality, Safe, Performance makes our product best. Radio remote control is easy to install and easy to use. Embicon is exclusive agent for Radio Remote Control in India. 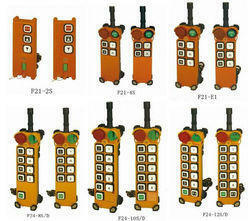 we serve all industrial remote control that will suit your needs. Reliable, Quality, Safe, Performance makes Embicon the right choice. Embicrane remote controls are easy to install and easy to use. Embicrane remote controls enable the operation of machinery from a safe operating distance. This is important especially when operating lifting equipment. The operator can be at a safe distance and also have the flexibility to move around, providing better visibility of the load. Embicrane Remote controls are CE certified and comply with many EU Directives. We are providing Radio Pushbutton in a large range. Double Speed Wireless Remote Control 6 button , 8 button pushbutton are available with good price. Embicon is Manufacturer for Tele crane Remote in India. we provide all industrial remote control that will suit your needs. Reliable, Quality, Safe, Performance makes our product best. Radio remote control are easy to install and easy to use.